Some motorists who fit winter tyres to their car to cope with snow are being charged higher insurance premiums, it has been claimed. AA Insurance Services says some people have been told to pay up to 20% more. Winter tyres should be much safer in the snow, but some insurers have been counting them as a modification to the manufacturer's specifications. The Association of British Insurers (ABI) says that is a mistake and premiums should not be higher. The AA's Ian Crowder said in some cases insurers were even refusing to offer cover if winter tyres were fitted. The mistake is being blamed on insurance company call centres, where not all staff may be aware of the safety implications. Over the last few weeks of wintry weather, winter, or snow tyres, have proved more popular than ever before. One supplier, Kwik Fit, says it has already sold 50,000 of them this year, compared with 2,000 last year. And it is warning that many retailers have now sold out of the standard sizes. The tyres provide improved performance on snow and ice. Once the temperature falls below seven degrees Celsius, standard tyres tend to harden up, reducing their grip. But winter tyres contain a higher proportion of natural rubber and silica, which keeps them more pliable in cold weather. In tests conducted by the British Tyre Manufacturers Association, a car braking at 60mph in wet conditions has a five metre shorter braking distance if it has winter tyres fitted. 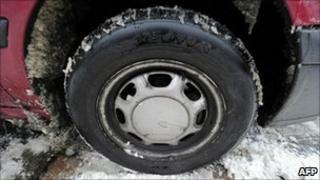 Should winter tyres be compulsory? "There's a very, very, strong argument that people in the UK should fit winter tyres for the four to five months of the autumn and winter," says Clare Simpson, of the RoadSafe organisation. Many other European countries have legislation that compels motorists to fit winter tyres in certain conditions. They include Austria, parts of Germany and countries in Scandinavia. But in practice, having a set of winter tyres means having a separate set of wheels, which can be expensive. BMW told the BBC that prices for its smallest car, a One Series, would start at £600. And you have to have somewhere to store the wheels as well. Nevertheless Clare Simpson believes we should be thinking about legislation. "We very much recommend that there should be a debate on this in the UK," she says. Even so, some call centre staff appear to have been telling customers that winter tyres require higher premiums. Insurance companies may have been treating the tyres as a modification to the manufacturer's specifications. The ABI said providing tyres are fitted by a reputable garage, and in accordance with the manufacturer's instructions, motorists should not be charged a higher premium. "The confusion may be through call centres, where that information is not getting through," says Malcolm Tarling, of the ABI. "The fitting of winter tyres should not affect the risk," he insists. If anyone is told they do in fact have to pay more when they fit those tyres, they are advised to contact their insurance company's head office directly.